Hunee's Daily Dish: Tiny's little "problem"
Your go to source for the latest dish on your favorite celebrities! This week alone, Paris Hilton was arrested (again) for drug possession and Lindsay Lohan shuffled home after she’d finished serving two weeks of her 90-day jail sentence, as well as in-patient residency in rehab. As a society, we’ve become numb to these kinds of occurrences. Another day, another celebrity arrest, right? Still, it’s hard to pretend as if T.I. and Tiny’s arrest Wednesday night does not disappoint. Police allegedly smelled marijuana emanating from the $400,000 Maybach (which T.I. bought as a “gift” to himself after leaving jail this year); then, they arrested the lovebirds at a traffic stop on Sunset Blvd. in West Hollywood. T.I. who was just released from prison in March on weapons charges, clearly wasn’t thinking about his probation. Was smoking weed all that necessary for him if he just got out of jail, has six kids, and a probation hanging over his head? And, what about Tiny? 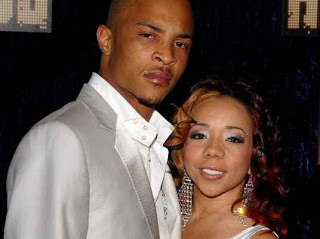 The poor thing seems so in love with T.I. that she can barely put her foot down and tell him no. No, baby, you cannot ruin your life, especially after having narrowly escaped a longer jail sentence last year. No, baby, we do not need to be smoking weed right about now. While I’m tempted to get supremely annoyed at the stereotype of ignorance that these two are perpetuating with this arrest, Clifford Harris and Tameka Cottle do not represent all of the community, nor do they represent all celebrities. If we take every arrest and/or bad action of celebrities—black, white, Asian, Latino—as our own we’ll never get anywhere “as a people.” Thank goodness I don’t wear black celebrity lives as my personal scar. As for you, T.I. and Tiny—and you, DMX and Mischa Barton and Charlie Sheen, I know you’re performers, but sheesh…the act is getting old. Is Mariah suffering from an illness? Well Lindsay's been sprung out of jail! Actor Gary Dourdan dodging creditor! Wire Talk: T.I. & Tiny Heading to Jail? Lil Kim slays Kontrol Magazine! Was Gabourey's Elle Cover photoshopped? Elise Neal in King magazine! T.I. and Tiny's troubles...no end in sight! Khloe Kardashian blasts her haters! Copyright © 2010 - Hunee's Daily Dish - is proudly powered by Blogger.